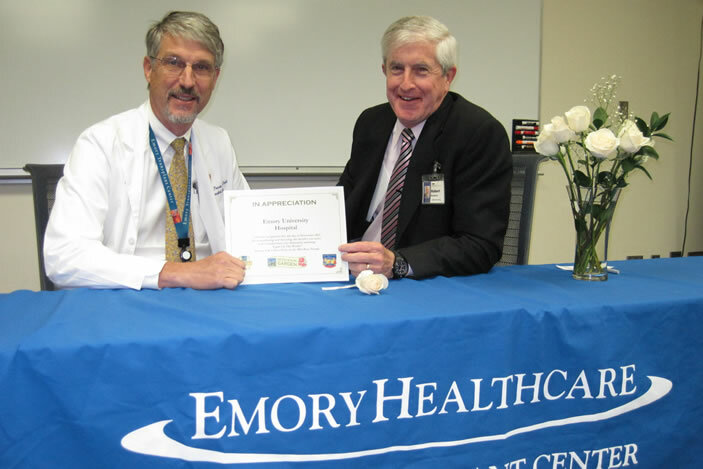 Left: Thomas Pearson, MD, director of the Emory Transplant Center and transplant surgeon. 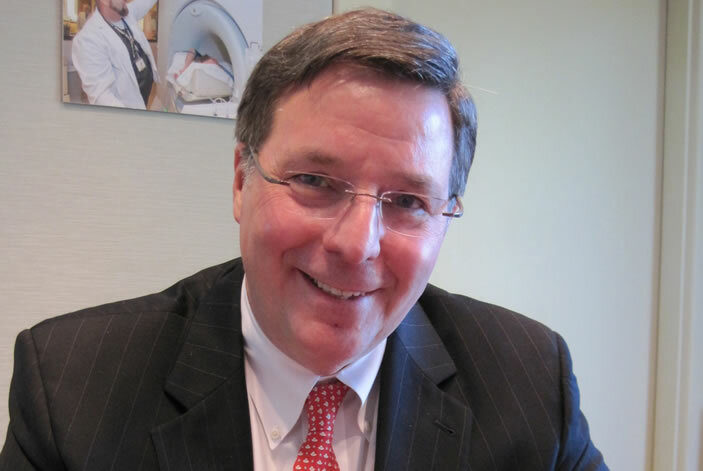 Right: Robert Bachman, CEO of Emory University Hospital. 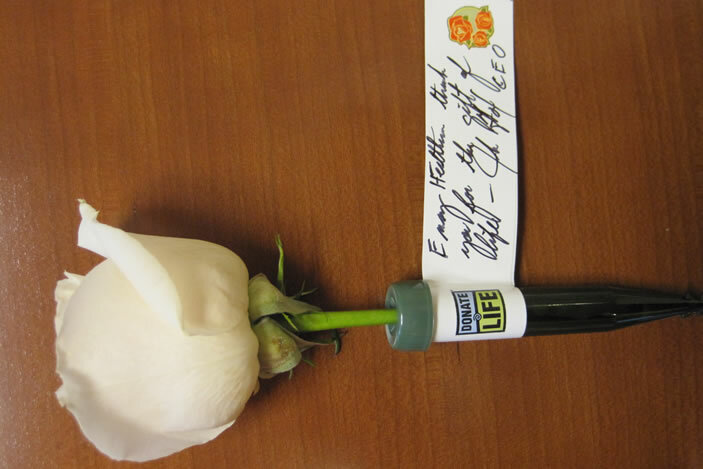 John Fox, president and CEO of Emory Healthcare signed a rose honoring organ donors and their families, which will be placed on the Donate Life float in the New Year's Day Rose Parade. 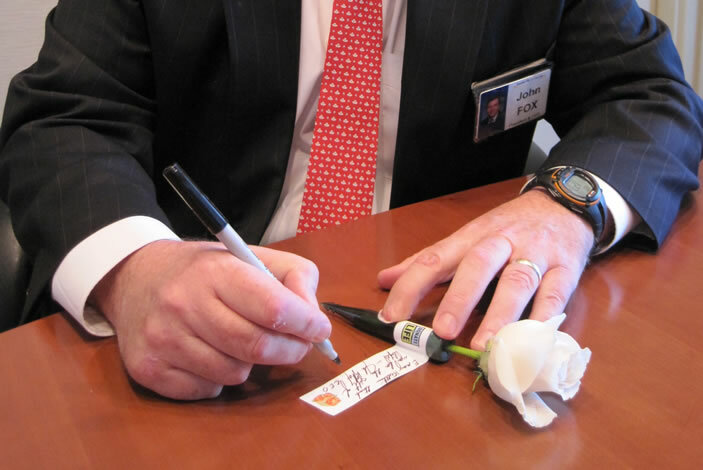 John Fox writes a message attached to a rose. Close-up of John Fox's rose. The New Year is still several months away, but already, Emory Healthcare is gearing up for the first day of 2014. That’s because two Emory transplant patients and an Emory transplant surgeon have plans to ring in the New Year in Pasadena, Ca. The two patients, an islet cell recipient and a liver recipient, have been invited to ride on the Donate Life float in the Rose Parade on Jan. 1. The float, with the 2014 theme of “Light Up the World,” honors donors, recipients and their families who have been involved with organ, eye or tissue donation. Festivities kicked off this week when John Fox, CEO of Emory Healthcare, and Robert Bachman, CEO of Emory University Hospital, wrote touching messages thanking donors and their families for giving the gift of life. Thomas Pearson, MD, director of the Emory Transplant Center and transplant surgeon, joined Bachman during the CEO Rose Dedication event at Emory University Hospital, where all transplant surgeries within Emory take place. Fox signed his remarks for the entire Emory Healthcare system. The handwritten messages are attached to individual vials that hold the roses on the float. Thousands of roses, all with personalized messages, create the Donate Life Dedication Garden. Nicole Turgeon, MD, associate professor of surgery at Emory and surgical director of the Paired Donor Exchange Program, will help decorate this year’s Donate Life float in California, along with Emory patients Julie Allred and Amy Tippins. Allred, an islet cell recipient times two, and Tippins, a liver recipient, will ride on the float with 28 other organ and tissue recipients. Twelve living donors will walk beside the float in the parade to demonstrate their ongoing vitality, while 81 deceased donors will be remembered with a memorial floragraph portrait on the float. The Rose Parade will air on New Year’s Day 2014 at 11 a.m. ET.